By valuing animal wisdom, we learn to value ours. We’ve all heard stories about animals running away to a place of safety before the tsunami hits. Cambridge scientist Rupert Sheldrake has written about animal telepathy in ‘Dogs That Know When Their Owners are Coming Home’. I have often noticed that my own wise cat has already arrived at a place in or around the garden before I get there. Examples of this mysterious animal ‘knowing’ are widely recorded. It’s somewhere between instinct and intuition, perhaps belonging to an older part of our brain that we have largely lost touch with. Here is a meditation that can help us to access that forgotten part of ourselves. Choose an animal. 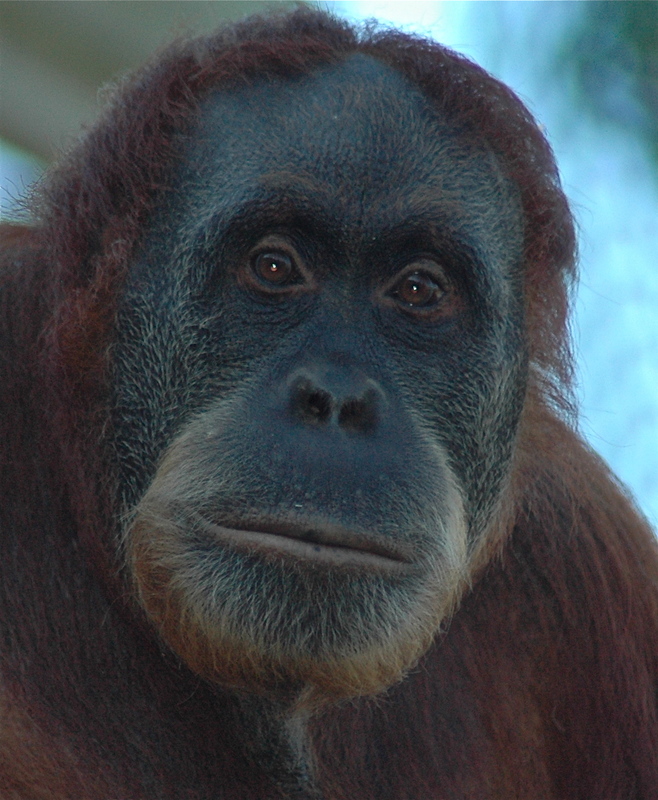 You could pick the orang-utan pictured here, or perhaps a pet you know and love. Take a few deep breaths, and then simply focus on the animal in your mind. First, really study the animal from the outside. How big or small is the animal’s presence; how quick or calm? What texture the fur; what colours do you notice? Now consider the animal’s mind, its way of being. Imagine what it must be like to be that animal. You will probably pick up a sense that it exists fully in the present: not rushing, not striving, just being. Whatever qualities you have noticed in the animal, be aware that you possess these very same qualities. All of them. Try them on for size. Sit still with these innate qualities: breathe them in, breathe them out. How do these qualities serve you in your own life? Send the animal your love and blessing, then reconnect again with who you are. Feel your consciousness expand to fill your body. Then, when you are ready, wriggle your fingers and toes, and stretch. Gerald Durrell had a great intuitive ability to connect with animals. I’m sure he understood their wisdom, and he inspired countless people to do the same. The primates I saw last weekend seemed to blend so well with their surroundings. They were somewhat like unstressed humans, – no deadlines, no pressures. And when they made eye contact, as I hope you can see from my photo, there was a real intelligence there – the wisdom of animal ‘knowing’. Such lovely comments Suzanne. I always think it is such a blessing to be able to communicate with animals – they are so loving, caring and intelligent – perhaps more so than than we humans some time. It was such a joy to experience the warm, loving welcome of our dog on my return from hospital recently. She stayed completely by my side for the following few days -amazing and wonderful. Love and Blessings. Thank you for your comment, Barbara. I love your account of how your dog greeted you from hospital – a great example of an animal sensing when extra help and support was in order. We do have much to learn from animals.